Last nite it rained. For air circulation, Scampy's rear window was opened a few inches. Rain entered thru the window screen. Some of that rain ran down the blind and then, into our 12-volt inverter. We tried to locate a new inverter online that was available for local pickup. Finding and buying that inverter took a few hours. First, we tried Best Buy and found very little selection inside the store. Click [Here] to see the inverter we bought. With all the tools and supplies in Señor Tránsito's storage, an installation as this one is sooooo easy! Can you make a cover of some kind to protect it? Can't keep the window closed forever. I am going to keep that window closed forever. There are three side windows that when open, don't allow rain to enter. Also two big roof vents, one vent with a fan. Replacing the inverter was a fun project for me! Good deal on the inverter. I bought a 1000W a couple of years ago. Works great but I wish I had a 1600W. I was being cheap. 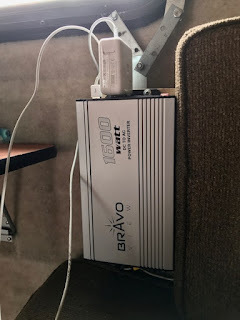 The largest wattage device that I charge is a power pack for dead battery. I just recharged that power pack. No problem with the new inverter! Does a cooling fan run when the inverter is turned on and running? Thanks. The old inverter had a fan. So far, I have not heard a fan in the new inverter. 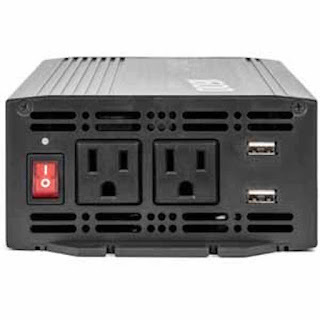 PS: The new inverter seems to be a rugged piece of equipment which does not have outlet circuit protection. I like that. Circuit protection is a real pain! I charged my 12 volt battery jump start battery device with the new inverter. 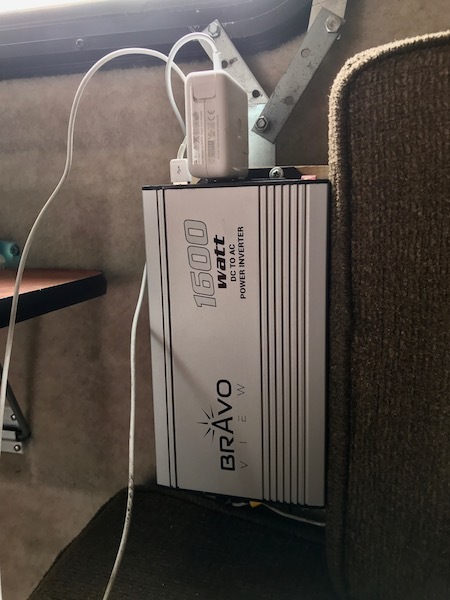 The old inverter often shut down when charging the jump starter.